A couple weeks ago Carla and I spent a weekend in Seattle. It wasn't a beer trip, but of course we ended up at a couple of beer spots: Brouwer's Cafe in Fremont, and the Tap House Grill downtown. 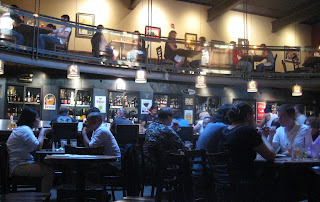 Brouwer's is well-known to Northwest beer aficionados, but it was my first visit to the place. I wasn't disappointed. Fifty beers on tap, hundreds more in bottles, all served in correct glassware and accompanied by delicious food. It doesn't look like much from the outside, but the spacious interior provides a wonderful atmosphere. As you can see in the picture, the bottles are part of the decor behind the bar, lovingly displayed behind evenly-spaced cooler doors. There are five different kinds of seating: you can sit at the bar, in a booth along the outside wall, at a table on the ground floor, at a table up in the loft area, or in one of the couches by the stairs. Make that six -- there's patio seating outside also. No minors allowed -- it's just for the grown-ups. For Portlanders like us, the big attraction was the draft Washington beers that are not available in Oregon, like the lovely cask-conditioned Port Townsend Hop Diggity IPA, and the masterful Boundary Bay Dry-Hopped IPA -- which you might have tried at the OBF this year. But there were many other attractions at Brouwer's: I finally had to order a St. Bernardus Abt 12 after seeing so many other patrons hefting their chalices of dark Belgian ale. And I got my hopes up when I saw Port Brewing's Old Viscosity on the bottle menu, but had to settle for a bottle of Port's Santa's Little Helper since the OV was sold out. The Tap House Grill in downtown Seattle is a different beast from Brouwer's, but worthy in its own right. 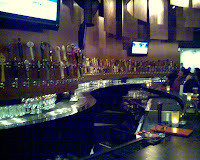 It boasts 160 beer taps, and it was a short walk from our hotel, so it seemed like an obvious choice for our first night's dinner. Descending from street-level into the restaurant, my first impression upon taking in the corporate atmosphere and TVs above the bar was "Uh oh, this is gonna be like Henry's Tavern in Portland". That feeling was reinforced when I opened the beer menu: it was printed up in almost exactly the same format as the Henry's menu -- beers categorized by style, no prices listed, asterisks next to the rare or expensive beers. My inquietude was quickly pacified, when I found out that our waiter actually knew something about the beer. He was able to help us choose between a couple of Washington beers that we were curious about, and he knew which ones were served in pints and which in smaller glasses. (That's what earns Henry's my enduring scorn -- I have never been served there by anyone who knew anything about the beer, including the quantity served.) Even better, when I asked what the Tap House's seasonals were, the waiter was able to punch a button on a cash register and get a printout of the 20 taps which weren't on the menu. Bravo! I had a decent Biere de Garde from Iron Horse; the Silver City Fat Scotch was a nice Wee Heavy. Carla enjoyed her Elysian Dragontooth Stout -- I know, I know, we can get that in Portland, but it was probably the best beer on our table. It seems like we had another Washington beer at the Tap House, but I can't remember what it was. The food was quite good also -- I had a spicy Thai salad that kept me reaching for my beer. We were there without kids, but I noticed kids at three or four tables -- it seemed to be a reasonably kid-friendly place. Any trip to Seattle must include a trip to Brouwer's. You probably knew that already, and now I do too. And I think the Tap House Grill is worth a visit if you're staying downtown -- not the most inspiring atmosphere, but family-friendly with good food and a great beer selection. re family-friendly: unless something has changed, I don't think Brouwer's allows minors in at any time. Lindsey: Read it again: I was referring only to the Tap House being kid-friendly. To avert confusion, I added a line to the Brouwer's section to point out that kids aren't allowed. Children? Family oriented? Maybe, we're just old fashion, but a beer bar/tavern/pub or BAR should be a place for adult interaction... and YES, all of the Wort Crew has children. Feel free to voice opposing views. Happy to see you enjoyed the experience! Like a place where we could ride to on our horses and put a foot up on the brass bar rail like in our younger years? Doc: as with nearly everything, a variety of choices is a good thing. Sometimes I want to be in a child-free bar, and sometimes I want to have a beer when the kids are along. A Brouwer's in Portland? Maybe the Seattle owners will find it in their hearts to open a satellite here. I'll definitely be looking for the Tap House because I'll be in downtown Seattle next month. Thanks for the tip. BTW: Boundary Bay had their special Amarillo Double Dry Hopped Pale Ale at OBF this year, not their IPA. However, both are delicious! Dor and Bob: Thanks, that detail slipped past me. Should have tried the BB at the OBF, but in my mind I had just had it in Seattle :-(.